Eighteen and a half hours after we took off from Seattle and we landed in Manila. We were worn out. The contrast was stark. Manila airport, unlike the western cleanliness, air conditioning and order of Taipei International Airport was humid, old, tired and packed. Huge jumbo jets were parked at every gate and on the tarmac. A slight musty smell hung in the air as we walked through the airport and joined a surging mass of new arrivals queuing up to clear immigration, collect their luggage and join the 20 million or so people packed into the greater Manila area. 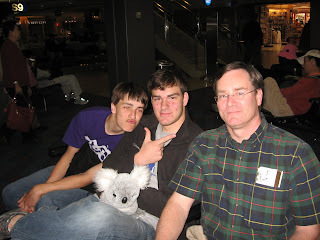 Once we cleared immigration we headed to the baggage carousel and waited to collect our luggage. We watched as cellophane taped box after box appeared and was gathered by traveling Filipo’s returning home with treasures from the United States. Logan’s skim board was the last to appear and like the rest of baggage survived the 7,000 or so mile journey. We quickly cleared customs and headed outside, down a ramp and into the heat and humidity. Michael had repeatedly told us to bring a sweat rag and his advise became evident. Once outside we went to a greeting area where new arrivals gather by last name and looked anxiously across the street into a cage where their loved ones or transportation gather to wait their arrival. 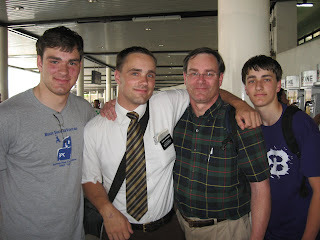 In a moment Elder Davidson, dressed in a worn-out stained short sleeve white shirt and baggy light weight brown pants, beat up Dr. Martin shoes and Edward, a driver appeared. The greeting was surreal. It was strange enough to be standing on a sweltering sidewalk—yet there was our son. He looked good. He was healthy and happy. His English had a slight lilt to it. We hugged him and began to visit. He looked at us all a little strangely and remarked that we all had big noses. It was an odd comment. But he been looking at small Filipono noses for the past two years. We chatted while Edward went to get the van. 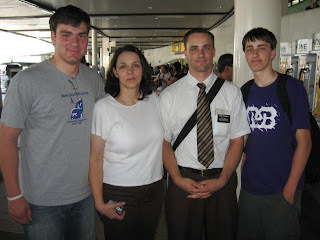 Once he returned we loaded our luggage and headed out into the streets of Manila for the 53 mile drive to the hotel and Mission Office at Clark Field. I learned to drive in Montreal, Canada, and have driven in the U.S. and Europe. Driving in the Philippines is unlike anything I have ever seen. At first I thought Edward was crazy and had a death wish. He pushed the van with in inches of cars, buses, and ubiquitous Jeepny’s, http://en.wikipedia.org/wiki/Jeepney as horns punctuated the air, trikes http://www.globalgiving.com/pr/1400/proj1357e.html and motorcycles surged into microscopic cracks in the traffic. It took a while to realize that everyone drove this way. Some how the frenetic pace with which the drivers weaved in and out worked. Lanes are simply guidelines. Five or six lanes of traffic routinely travel on three lanes. We thought the roads were packed. Only at the end of our trip did we learn what congestion was. Clark Field is a Special Economic Zone on the former US Air Force base 3 miles outside the city of Angeles. The base was turned over to the Philippine government, along with Subic Bay Naval base to the southwest in 1991. The former base sits in the shadow of Mt. Pinatubo http://pubs.usgs.gov/fs/1997/fs115-97/ . We checked in to the Oxford Hotel. We were among a handful of guests at the run down property. The hotel was originally built as a Marriott Hotel about the time of the eruption. The tropical climate is not kind to buildings. A strong musty smell permeated the property. There was mildew in the shower curtains, and bathroom walls. The towels were damp. No hot water to speak of. 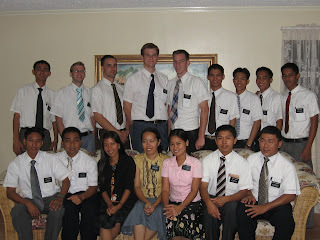 We quickly cleaned up as best we could, changed into church clothes and headed to the Mission Home for a farewell dinner and meeting for the 14 Elders and three Sister missionaries heading home. Three of the Elders were American and one was Australian. The balance were from the Philippines. We were greeted warmly by the Mission President and Sister Stringham and enjoyed a Filipino dinner of rice, chicken and fruit. Afterwards everyone gathered for comments and council by President and Sister Stringham. Each of the missionaries also took the opportunity to say a few words about their missions, and share their testimonies about the gospel. It was a moving experience. We then headed back to hotel with Michael for some much needed rest.